Whenever you post something on your Facebook wall, you have full control over who will see it - in many cases, you will want to hide your wall posts from non-friends, if only to be on the safe side: many people have had problems with their employer when some of their posts became known. But as you'll learn in this tutorial, you can even hide your wall posts from everyone. There is no right answer when it comes to your Facebook privacy, but we recommend that you err on the side of caution, when in doubt! The second part of this tutorial also explains how to allow or prevent other Facebook users from posting on your wall. Scroll down until you see the "How You Connect" header, and click on the "Edit Settings" link. • "Public" means that everyone will see them. • "Friends of Friends" means that both your friends and their direct friends will be able to see what was posted by people on your wall. • "Friends"? Only your own friends will see what anyone has posted on your wall. 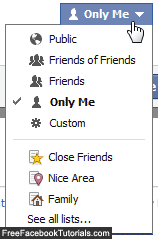 • "Only Me" is the highest level of privacy for posts by others on your Facebook wall. • Choose "Custom" to pick a specific list of people who can see these posts. • Or Facebook lets you pick a particular list of people who will be able to view posts on your wall. Once you've made your choice, click on the "Done" button (or keep it open and read on). To do so, open the same popup: click "Edit Settings" on the right of "How You Connect". Tip: before choosing, keep in mind that you can always manually delete posts by others (or yourself) on your wall: move your mouse pointer (cursor) over the post in question, and click on the "x" close button next to it. Click on the "Done" button once you have made your choice. While you are still on the Privacy Settings screen, click on the "Manage Past Post Visibility" link next to "Limit the Audience for Past Posts" near the bottom of the page. When the "Limit Audience..." popup opens, clicking on the "Limit Old Post" button will hide all old posts on your wall from anyone on Facebook, with the exception outlined on the dialog - friends, and tagged people, may still see these posts for shared content. To completely hide an old post and "granularly" control which Facebook users can see it, go to the post, move your cursor above it, and choose the level of privacy / visibility with which you fell comfortable.